The Pliocene ( /ˈplaɪəˌsiːn/; also Pleiocene) Epoch is the epoch in the geologic timescale that extends from 5.333 million to 2.58 million years BP. It is the second and youngest epoch of the Neogene Period in the Cenozoic Era. The Pliocene follows the Miocene Epoch and is followed by the Pleistocene Epoch. Prior to the 2009 revision of the geologic time scale, which placed the four most recent major glaciations entirely within the Pleistocene, the Pliocene also included the Gelasian stage, which lasted from 2.588 to 1.806 million years ago, and is now included in the Pleistocene. As with other older geologic periods, the geological strata that define the start and end are well identified but the exact dates of the start and end of the epoch are slightly uncertain. The boundaries defining the Pliocene are not set at an easily identified worldwide event but rather at regional boundaries between the warmer Miocene and the relatively cooler Pliocene. The upper boundary was set at the start of the Pleistocene glaciations. Charles Lyell (later Sir Charles) gave the Pliocene its name in Principles of Geology (volume 3, 1833). The word pliocene comes from the Greek words πλεῖον (pleion, "more") and καινός (kainos, "new" or "recent") and means roughly "continuation of the recent", referring to the essentially modern marine mollusc fauna. H.W. Fowler called the term Pliocene (like other geological jargon such as pleistocene and miocene) a "regrettable barbarism" and an indication that even "a good classical scholar" such as Lyell should have requested a philologist's help when coining words. Pleistocene most-new πλεῖστος pleīstos "most"
Pliocene more-new πλεῖον pleion "more"
Miocene less-new μείων meiōn "less"
Oligocene few-new ὀλίγος oligos "few"
Eocene dawn-new ἠώς ēṓs "dawn"
Paleocene old-new παλαιός palaios "old(er)"
with the understanding that these are all new relative to the Mesozoic ("middle life" - the age of dinosaurs) and Paleozoic ("old life" - Trilobites, coal forests, and the earliest Synapsida) eras. The Piacenzian is sometimes referred to as the Late Pliocene, whereas the Zanclean is referred to as the Early Pliocene. North American Land Mammal Ages (NALMA) include Hemphillian (9–4.75 Ma), and Blancan (4.75–1.806 Ma). The Blancan extends forward into the Pleistocene. South American Land Mammal Ages (SALMA) include Montehermosan (6.8–4.0 Ma), Chapadmalalan (4.0–3.0 Ma) and Uquian (3.0–1.2 Ma). In the Paratethys area (central Europe and parts of western Asia) the Pliocene contains the Dacian (roughly equal to the Zanclean) and Romanian (roughly equal to the Piacenzian and Gelasian together) stages. As usual in stratigraphy, there are many other regional and local subdivisions in use. In Britain the Pliocene is divided into the following stages (old to young): Gedgravian, Waltonian, Pre-Ludhamian, Ludhamian, Thurnian, Bramertonian or Antian, Pre-Pastonian or Baventian, Pastonian and Beestonian. In the Netherlands the Pliocene is divided into these stages (old to young): Brunssumian C, Reuverian A, Reuverian B, Reuverian C, Praetiglian, Tiglian A, Tiglian B, Tiglian C1-4b, Tiglian C4c, Tiglian C5, Tiglian C6 and Eburonian. The exact correlations between these local stages and the ICS stages is still a matter of detail. The global average temperature in the mid-Pliocene (3.3–3 mya) was 2–3 °C higher than today, carbon dioxide levels were the same as today, and global sea level was 25 m higher. The northern hemisphere ice sheet was ephemeral before the onset of extensive glaciation over Greenland that occurred in the late Pliocene around 3 Ma. The formation of an Arctic ice cap is signaled by an abrupt shift in oxygen isotope ratios and ice-rafted cobbles in the North Atlantic and North Pacific ocean beds. Mid-latitude glaciation was probably underway before the end of the epoch. The global cooling that occurred during the Pliocene may have spurred on the disappearance of forests and the spread of grasslands and savannas. Examples of migrant species in the Americas after the formation of the Isthmus of Panama. Olive green silhouettes denote North American species with South American ancestors; blue silhouettes denote South American species of North American origin. Continents continued to drift, moving from positions possibly as far as 250 km from their present locations to positions only 70 km from their current locations. South America became linked to North America through the Isthmus of Panama during the Pliocene, making possible the Great American Interchange and bringing a nearly complete end to South America's distinctive large marsupial predator and native ungulate faunas. The formation of the Isthmus had major consequences on global temperatures, since warm equatorial ocean currents were cut off and an Atlantic cooling cycle began, with cold Arctic and Antarctic waters dropping temperatures in the now-isolated Atlantic Ocean. Africa's collision with Europe formed the Mediterranean Sea, cutting off the remnants of the Tethys Ocean. The border between the Miocene and the Pliocene is also the time of the Messinian salinity crisis. Sea level changes exposed the land bridge between Alaska and Asia (Beringia). Pliocene marine rocks are well exposed in the Mediterranean, India, and China. Elsewhere, they are exposed largely near shores. During the Pliocene parts of southern Norway and southern Sweden that had been near sea level rose. In Norway this rise elevated the Hardangervidda plateau to 1200 m in the Early Pliocene. In Southern Sweden similar movements elevated the South Swedish highlands leading to a deflection of the ancient Eridanos river from its original path across south-central Sweden into a course south of Sweden. The change to a cooler, dry, seasonal climate had considerable impacts on Pliocene vegetation, reducing tropical species worldwide. Deciduous forests proliferated, coniferous forests and tundra covered much of the north, and grasslands spread on all continents (except Antarctica). Tropical forests were limited to a tight band around the equator, and in addition to dry savannahs, deserts appeared in Asia and Africa. Both marine and continental faunas were essentially modern, although continental faunas were a bit more primitive than today. The first recognizable hominins, the australopithecines, appeared in the Pliocene. The land mass collisions meant great migration and mixing of previously isolated species, such as in the Great American Interchange. Herbivores got bigger, as did specialized predators. The gastropod Oliva sayana, from the Pliocene of Florida. The coral Cladocora from the Pliocene of Cyprus. A gastropod and attached serpulid wormtube from the Pliocene of Cyprus. The gastropod Turritella carinata from the Pliocene of Cyprus. The thorny oyster Spondylus right and left valve interiors from the Pliocene of Cyprus. Articulated Spondylus from the Pliocene of Cyprus. The limpet Diodora italica from the Pliocene of Cyprus. The scaphopod Dentalium from the Pliocene of Cyprus. The gastropod Aporrhais from the Pliocene of Cyprus. The arcid bivalve Anadara from the Pliocene of Cyprus. The pectenid bivalve Ammusium cristatum from the Pliocene of Cyprus. Vermetid gastropod Petaloconchus intortus attached to a branch of the coral Cladocora from the Pliocene of Cyprus. In North America, rodents, large mastodons and gomphotheres, and opossums continued successfully, while hoofed animals (ungulates) declined, with camel, deer and horse all seeing populations recede. Rhinos, three toed horses (Nannippus), oreodonts, protoceratids, and chalicotheres became extinct. Borophagine dogs and Agriotherium became extinct, but other carnivores including the weasel family diversified, and dogs and short-faced bears did well. Ground sloths, huge glyptodonts, and armadillos came north with the formation of the Isthmus of Panama. In Eurasia rodents did well, while primate distribution declined. Elephants, gomphotheres and stegodonts were successful in Asia, and hyraxes migrated north from Africa. Horse diversity declined, while tapirs and rhinos did fairly well. Cows and antelopes were successful, and some camel species crossed into Asia from North America. Hyenas and early saber-toothed cats appeared, joining other predators including dogs, bears and weasels. Africa was dominated by hoofed animals, and primates continued their evolution, with australopithecines (some of the first hominins) appearing in the late Pliocene. Rodents were successful, and elephant populations increased. Cows and antelopes continued diversification and overtaking pigs in numbers of species. Early giraffes appeared. Horses and modern rhinos came onto the scene. Bears, dogs and weasels (originally from North America) joined cats, hyenas and civets as the African predators, forcing hyenas to adapt as specialized scavengers. South America was invaded by North American species for the first time since the Cretaceous, with North American rodents and primates mixing with southern forms. Litopterns and the notoungulates, South American natives, were mostly wiped out, except for the macrauchenids and toxodonts, which managed to survive. Small weasel-like carnivorous mustelids, coatis and short-faced bears migrated from the north. Grazing glyptodonts, browsing giant ground sloths and smaller caviomorph rodents, pampatheres, and armadillos did the opposite, migrating to the north and thriving there. The marsupials remained the dominant Australian mammals, with herbivore forms including wombats and kangaroos, and the huge Diprotodon. Carnivorous marsupials continued hunting in the Pliocene, including dasyurids, the dog-like thylacine and cat-like Thylacoleo. The first rodents arrived in Australia. The modern platypus, a monotreme, appeared. The predatory South American phorusrhacids were rare in this time; among the last was Titanis, a large phorusrhacid that migrated to North America and rivaled mammals as top predator. Other birds probably evolved at this time, some modern, some now extinct. Alligators and crocodiles died out in Europe as the climate cooled. Venomous snake genera continued to increase as more rodents and birds evolved. Rattlesnakes first appeared in the Pliocene. The modern species Alligator mississippiensis, having evolved in the Miocene, continued into the Pliocene, except with a more northern range; specimens have been found in very late Miocene deposits of Tennessee. Giant tortoises still thrived in North America, with genera like Hesperotestudo. Madtsoid snakes were still present in Australia. The amphibian order Allocaudata became extinct. Oceans continued to be relatively warm during the Pliocene, though they continued cooling. The Arctic ice cap formed, drying the climate and increasing cool shallow currents in the North Atlantic. Deep cold currents flowed from the Antarctic. The formation of the Isthmus of Panama about 3.5 million years ago cut off the final remnant of what was once essentially a circum-equatorial current that had existed since the Cretaceous and the early Cenozoic. This may have contributed to further cooling of the oceans worldwide. The Pliocene seas were alive with sea cows, seals, sea lions and sharks. In 2002, Narciso Benítez et al. calculated that roughly 2 million years ago, around the end of the Pliocene epoch, a group of bright O and B stars called the Scorpius-Centaurus OB association passed within 130 light-years of Earth and that one or more supernova explosions gave rise to a feature known as the Local Bubble. Such a close explosion could have damaged the Earth's ozone layer and caused the extinction of some ocean life (at its peak, a supernova of this size could have the same absolute magnitude as an entire galaxy of 200 billion stars). 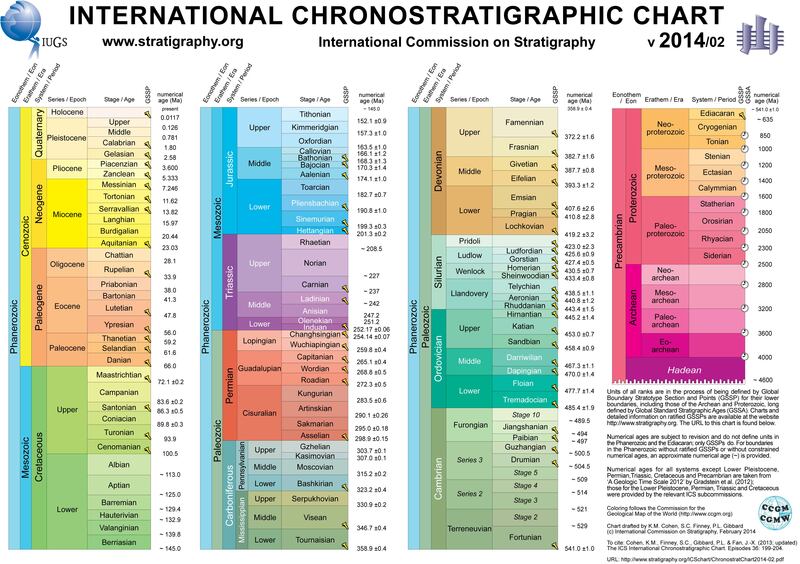 ^ "ICS Timescale Chart". www.stratigraphy.org. ^ "Pliocene". Dictionary.com Unabridged. Random House. ^ "Pleiocene". Dictionary.com Unabridged. Random House. ^ Ogg, James George; Ogg, Gabi; Gradstein F. M. (2008). The Concise Geologic Time Scale. Cambridge University Press. pp. 150–1. ISBN 9780521898492. Letter from William Whewell to Charles Lyell dated 31 January 1831 in: Todhunter, Isaac, ed. (1876). William Whewell, D. D., Master of Trinity College, Cambridge: An account of his writings with selections from his literary and scientific correspondence. vol. 2. London, England: Macmillan and Co. p. 111. Lyell, Charles (1833). Principles of Geology, …. vol. 3. London, England: John Murray. p. 53. From p. 53: "We derive the term Pliocene from πλειων, major, and χαινος, recens, as the major part of the fossil testacea of this epoch are referrible to recent species*." ^ "Pliocene". Online Etymology Dictionary. ^ Fowler, H.W. (2009). David Crystal, ed. A Dictionary of Modern English Usage: The Classic First Edition (Reissue ed.). USA: Oxford University Press. ISBN 978-0-19-953534-7. ^ Kuhlmann, G.; C.G. Langereis; D. Munsterman; R.-J. van Leeuwen; R. Verreussel; J.E. Meulenkamp; Th.E. Wong (2006). "Integrated chronostratigraphy of the Pliocene-Pleistocene interval and its relation to the regional stratigraphical stages in the southern North Sea region" (PDF). Netherlands Journal of Geosciences. 85: 19–35. doi:10.1017/S0016774600021405. ^ Robinson, M.; Dowsett, H.J. ; Chandler, M.A. (2008). "Pliocene role in assessing future climate impacts". Eos, Transactions, American Geophysical Union. 89 (49): 501–502. Bibcode:2008EOSTr..89..501R. doi:10.1029/2008eo490001. ^ "Solutions: Responding to Climate Change". Climate.Nasa.gov. Retrieved 1 September 2016. ^ Dwyer, G.S. ; Chandler, M.A. (2009). "Mid-Pliocene sea level and continental ice volume based on coupled benthic Mg/Ca palaeotemperatures and oxygen isotopes". Phil. Trans. Royal Soc. A. 367 (1886): 157–168. Bibcode:2009RSPTA.367..157D. doi:10.1098/rsta.2008.0222. PMID 18854304. ^ Bartoli, G.; et al. (2005). "Final closure of Panama and the onset of northern hemisphere glaciation". Earth Planet. Sci. Lett. 237 (1–2): 3344. Bibcode:2005E&PSL.237...33B. doi:10.1016/j.epsl.2005.06.020. ^ Van Andel (1994), p. 226. ^ "The Pliocene epoch". University of California Museum of Paleontology. Retrieved 2008-03-25. ^ Japsen, Peter; Green, Paul F.; Chalmers, James A.; Bonow, Johan M. (17 May 2018). "Mountains of southernmost Norway: uplifted Miocene peneplains and re-exposed Mesozoic surfaces". Journal of the Geological Society. 175 (5): 721–741. doi:10.1144/jgs2017-157. ^ Lidmar-Bergström, Karna; Olvmo, Mats; Bonow, Johan M. (2017). "The South Swedish Dome: a key structure for identification of peneplains and conclusions on Phanerozoic tectonics of an ancient shield". GFF. ^ Katie Pennicott (Feb 13, 2002). "Supernova link to ancient extinction". physicsworld.com. Retrieved 16 July 2012. Comins, Niel F.; William J. Kaufmann III (2005). Discovering the Universe (7th ed.). New York, NY: Susan Finnemore Brennan. ISBN 978-0-7167-7584-3. Gradstein, F.M. ; Ogg, J.G. & Smith, A.G.; 2004: A Geologic Time Scale 2004, Cambridge University Press. Ogg, Jim (June 2004). "Overview of Global Boundary Stratotype Sections and Points (GSSP's)". Archived from the original on 2006-04-23. Retrieved 2006-04-30. Van Andel, Tjeerd H. (1994). New Views on an Old Planet: a History of Global Change (2nd ed.). Cambridge: Cambridge University Press. ISBN 978-0-521-44243-5. Wikimedia Commons has media related to Pliocene.